A group of Optometrists and students from the Bausch & Lomb School of Optometry conducted a vision screening program on 26th May 2013 at Sishu Vihar, a state run orphanage in Hyderabad. A total of 124 children as young as a month’s old baby to 6 years of age were screened. Of the total number screened, eleven children were identified to have ocular problems and were referred to L.V. Prasad Eye Institute for further management. These children were examined and appropriately treated free of cost. The common eye conditions in these children included refractive errors and strabismus. Besides this, there were children who were anopthahlmic (no eyeballs) or who had multiple disabilities (e.g. cerebral palsy) and were in fact left in the orphanage for such reasons. The LVPEI rehabilitation department is providing training to two such children. Sishu Vihar's administrative staffs were very supportive and happy to receive the team from LVPEI for the vision screening. They helped in setting up the arrangements for examining the children. Some of the caretakers also asked the team to check their vision, which the team did willingly. Many of the elderly caretakers were recommended refractive and presbyopic corrections. 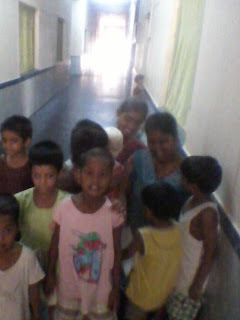 The kids in the orphanage were extremely happy to see a group of 'new' people visiting them. Usually, young children are not fond of hospitals or health care professionals. On the contrary, many of these children were very disciplined, stood in lines and cooperated well for their eye check-up. The optometrists also enjoyed providing services to the kids, and made the children recite and sing alphabets and rhymes. The children who came for a referral visit were cooperative and did not fuss and cry whilst getting their eye drops or for getting their fundus examined. Prabhakar, a 7 or 8 year old boy who only has one functional eye and is also speech and hearing impaired, was so excited to be checked that he opened his eyes wide with his tiny fingers to help the optometrist do her job! This screening served as a good opportunity to extend LVPEI’s services to a part of the society that is often much neglected. Mr. Nadella Srinivas Rao from Gandigunta town near Vuyyuru in Krishna district has been suffering from diabetes since many years. However, all of a sudden, his right eyeball stopped moving. This not only made vision difficult, but also resulted in Srinivas Rao seeing two objects in the place of one. He consulted several doctors a but to no avail. Later, on the advice of friends, he sought consultation at LVPEI's Kode Venkatadri Chowdary campus at Vijayawada. Dr Niranjan Pehere saw him and provided useful advice to help alleviate his problem. 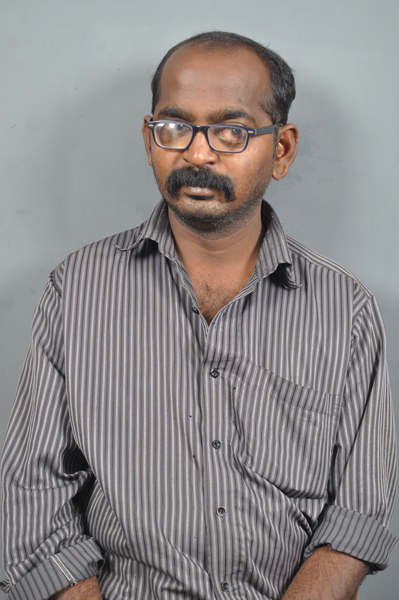 Under the doctor’s supervision, Mr.Srinivas Rao was administered steroid injections. In just about a week, dramatic recovery was noticed. In three months, he was his previous self with his vision restored. The delighted Mr Srinivas Rao is now cheerfully carrying out his daily activities as normally as any other person. Mr. Srinivas Rao says that the treatment and the counseling offered to patients at LVPEI is highly encouraging. He recalls with gratitude the courage instilled in him by the entire team of doctors and staff, and is ever thankful to them for helping him regain normalcy. Krishna Barik, a three year old boy diagnosed with Aphakia in both the eyes, was brought to the NTPC Centre for Rehabilitation at LVPEI Bhubaneswar for early intervention services. Aphakia is the absence of the lens of the eye. This could be due to surgical removal, a perforating wound or ulcer, or congenital anomaly. It causes a loss of accommodation, far sightedness (hyperopia), and a deep anterior chamber. 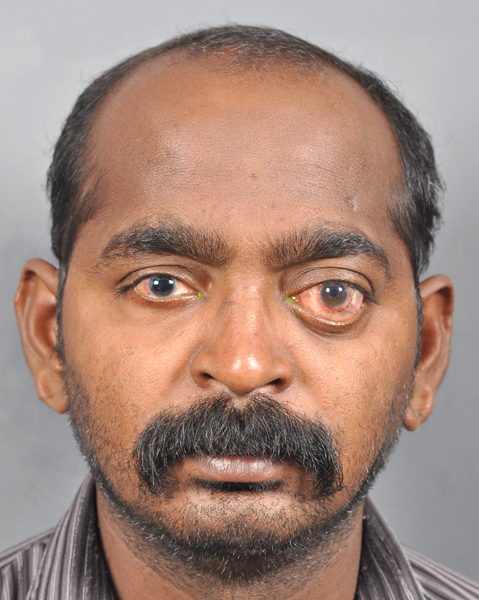 Complications include detachment of the vitreous or retina, and glaucoma. People with aphakia have relatively small pupils and their pupils dilate to a lesser degree. 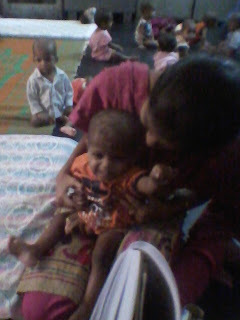 At the Rehab Centre, little Krishna's every activity was assessed thoroughly. Krishna had developmental delays in areas such as motor skills, speech, cognitive and social skills. The child also had behavioral problems. Though his parents were aware of his condition, they were unable to do anything for their child. They had found no centre in their vicinity to provide comprehensive rehabilitation services. At the NTPC Centre for Rehabilitation, they were encouraged to begin early intervention services once in a week. Gradually, the parents understood that through a personalized rehabilitation program, their child’s performance would improve to a great extent. The child and the parents have since benefited from the early identification and timely intervention.The efforts and support of the LVPEI team have helped them to cope up with their situation, and they are grateful for that.